The 40 year sentence slapped on Radovan Karadžić for war crimes by a Hague court this week prompted many to ask, what about former US Secretary of State Madeleine Albright? The former Bosnian Serb leader still maintains that Albright and her former colleague Richard Holbrooke offered him a deal to flee if he agreed to 'keep a low profile', although both Americans deny these claims. #Karadžić verdict due out today. Unsurprisingly Madeline Albright the butcher of Iraqis offered him a deal. Albright, who recently implied that there was a special place in hell for American women who don’t vote for Hillary Clinton, is no stranger to controversy. Good to see Karadžić being brought to justice. Wish they would go after Albright and others responsible for the NATO bombings too though. From shocking statements to questionable interventions, here are just a few of the reasons people call her everything from the "butcher of Iraq" to "Madame Cojones." The North Atlantic alliance fought on the side of the Kosovo Liberation Army, which the US had named as a terrorist organization in the past. In March of 1999, the Serbians had refused to sign the Rambouillet peace accord, to which Albright had made a last minute addition calling for the military occupation of Yugoslavia. There was also a condition requiring a free market economy in Kosovo. @RealJamesWoods@M0L0NL4BE Albright committed war crimes against the Serbs! Despicable and evil woman! As was the case in Libya and many other countries before it, the alleged atrocities presented by NATO as a pretext for urgent military intervention proved to be exaggerated. Rather than the purported 100,000 deaths, only 5,000 were found, many of which occurred after NATO began its operations, and were carried out by the Albanians. Following NATO’s bombing of Serbia in 1999, Albright’s financial management company was involved in the privatization of Kosovo’s telecommunications company. The ethnic cleansing carried out by the Tutsis against the Hutus in 1994 could have been prevented. The US, France, and Belgium knew of the genocide and not only failed to intervene, but prevented peacekeepers from moving in to save thousands of lives. Albright refused to call the attacks genocide. “The Americans, led by US Ambassador Madeleine Albright, played the key role in blocking more expeditious action by the UN... and with American UN Ambassador Madeleine Albright advocating the most token of forces and the United States adamantly refusing to accept publicly that a full-fledged, Convention-defined genocide was in fact taking place,” a post-genocide report established. Albright maintained brutal sanctions on the people of Iraq for more than a decade and defended the death of half a million children as a result. In 2012, Albright verbally abused a group of pro-Serbian activists at a book signing in Prague. The group had come to the event armed with photographs of victims of the Kosovo war. 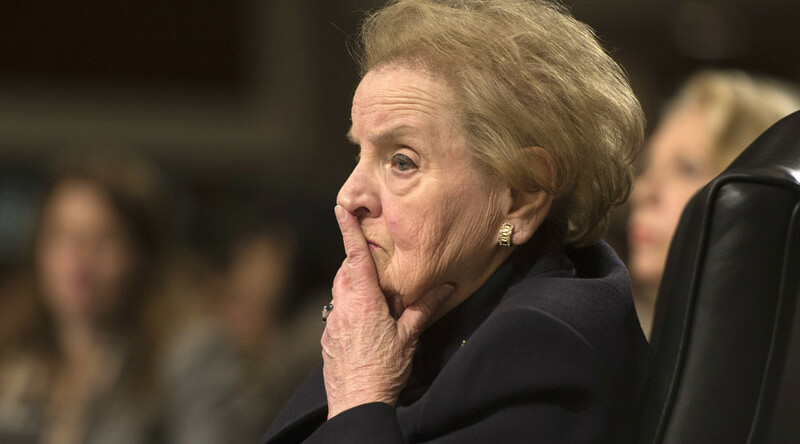 Albright was caught on film crying, “Get out, you disgusting Serbs!” The group reported the incident to the police, accusing Albright of spreading ethnic hatred and disrespecting victims of war. Albright has worked to prevent recognition of the Armenian genocide, angering the ancient nation’s sizeable US population. The Armenian National Committee of America protested against Albright’s appointment as co-chair of the US’ Genocide Prevention Task Force in 2008. One of my few pleasure of working at @usip was getting to ask Albright, as chair of genocide task force, about Armenia. She filibustered. “Secretaries Albright and Cohen both have long track records, both as government officials and private citizens, of working to block American recognition of the Armenian Genocide,” ANCA Executive Director Aram Hamparian said at the time. Albright wrote to House Speaker Nancy Pelosi in 2007 to oppose legislation that would have recognized the Armenian Genocide as a crime against humanity. In 1996, Albright insisted that UN Secretary General Boutros-Ghali not publish a report on Israel’s bombing of the Qana refugee camp in Lebanon that same year. The report concluded that the attack, which killed more than 100 refugees, was intentional. Albright threatened to veto Boutras-Ghali’s second term if he released the information to the public, which the US did when the Secretary General went ahead and published it. After years of oppression under Indonesian dictator General Suharto, when the people of East Timor were finally allowed to vote for independence in 1999, government-backed militias began attacking the people almost immediately. “The evidence for a direct link between the militia and the military is beyond dispute and has been overwhelmingly documented by Unamet over the last four months,” according to the UN mission. The United States refused to do anything to prevent the violence and intimidation leading up to the referendum, and engaged in delaying tactics to stall UN peacekeepers from helping the people of East Timor due to the US’ close relationship with Suharto.